I’m Dr. James Bemis. 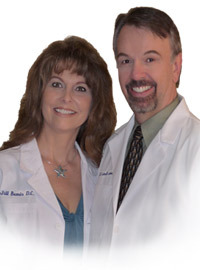 My colleague, Dr. Jill Bemis and I are pleased to welcome you to Bemis Chiropractic Clinic. Tour our website. You’ll find answers to many of the most common questions people in Prineville, Bend, and Central Oregon ask about chiropractic and natural health care. As chiropractors, we’ve helped thousands of people overcome pain, and chances are, we can help you as well with chiropractic care. Our first goal, as chiropractors, is to provide you with prompt pain relief. This is accomplished by using advanced treatment methods designed to ease your pain as quickly as possible. Take a moment to view our testimonial section and see how chiropractic care has helped others like you with the same complaints. Call today to arrange a consultation at Prineville office and find out why Central Oregon area residents have been choosing Bemis Chiropractic Clinic since 1986. I know each and every time I come in, all of you will take great care of me! You are all such a blessing to me! Thank you so much!